With the hard water buildup and stains, it was difficult to appreciate the beauty of the fountain. The grout lines were stained and unsightly. Notice the discoloration on the inner side of the fountain walls. 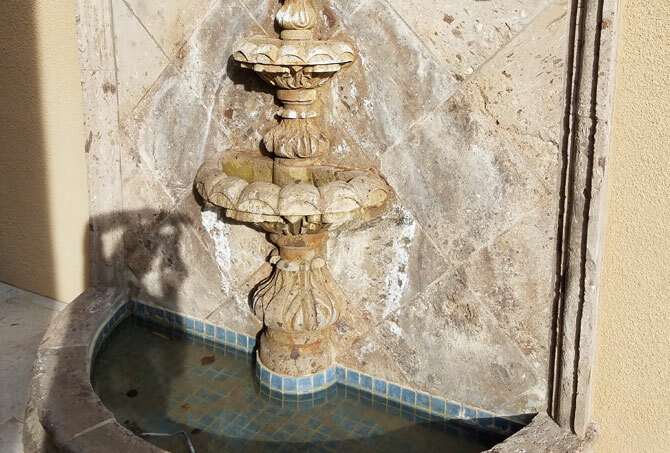 With the hard water buildup and stains removed, this fountain has a fresh, new look. 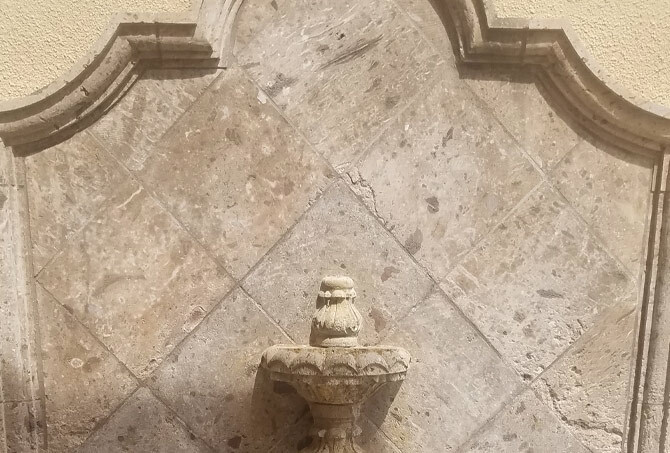 The beauty of the stone is revealed after professional fountain cleaning and restoration. 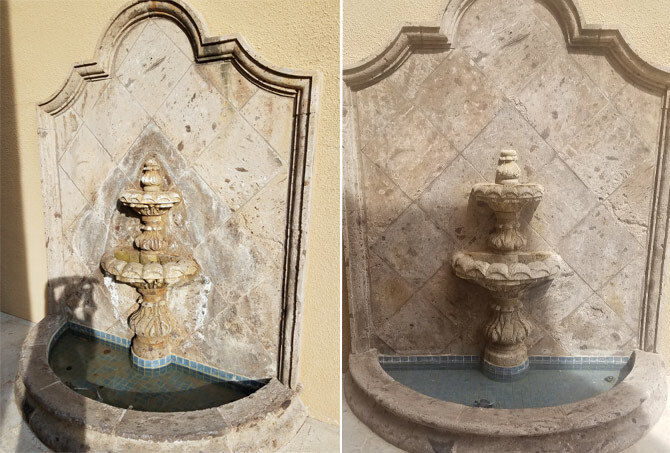 This side-by-side comparison of the fountain before and after restoration really demonstrates the difference our services made. Fountains can be prized focal points in an outdoor area, but when scale or mineral deposits develop, they become an eyesore. 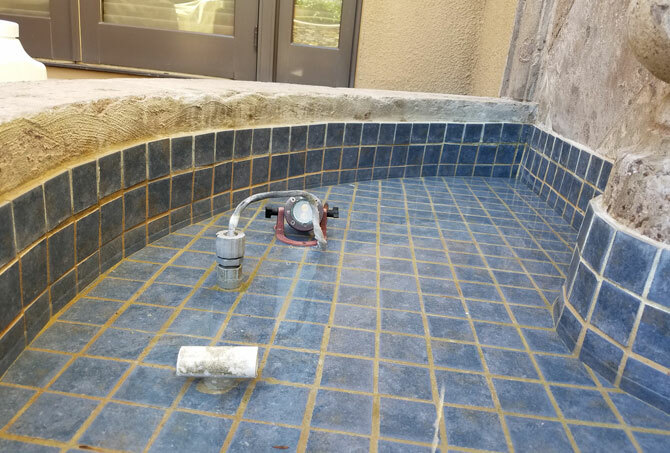 Constantly running calcium-rich water resulted in the discoloration of this fountain in the exterior living space of this Scottsdale home. Cleaning cantera or tile with calcium buildup can be difficult. 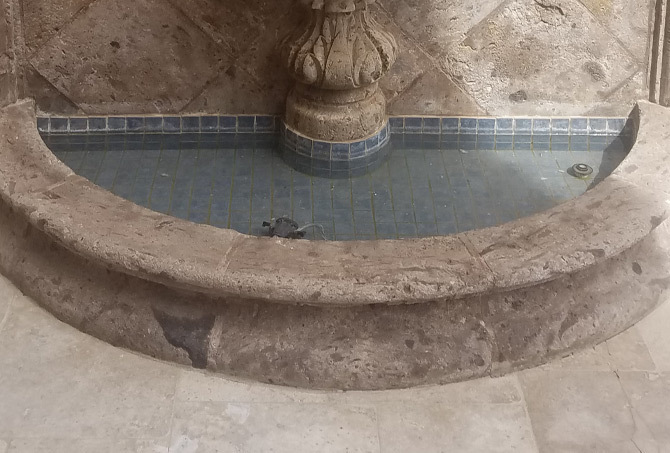 It is best to rely on a professional stone and tile restoration contractor equipped with the proper tools and innovative cleaning techniques to remove the buildup without causing damage to the surface of the fountain. Our dustless media blasting process is very effective and precise and eliminates the need for harsh chemicals. Our highly trained technicians were able to remove the calcium build up and completely restore the beautiful appearance of the fountain. We cleaned the grout lines and tiles along the bottom of the small pool area. Once everything was dry, we sealed the cantera and the porous grout lines. Our clients were extremely satisfied with the results of our services. To learn more about cantera services, visit our Cantera Services page. To learn more about our tile and grout services, visit our Tile and Grout Services page. 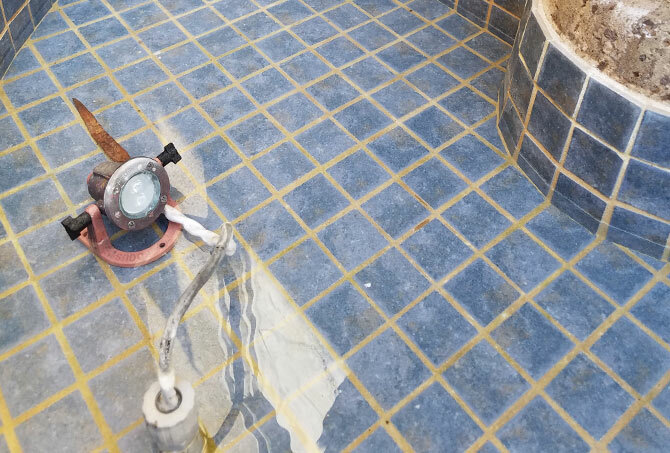 For a FREE estimate on cantera blasting and sealing or tile and grout cleaning and sealing services throughout Scottsdale, as well as the Phoenix and Tempe area, use our contact form or call (602) 993-9800 today.